Aida-America, Dayton, OH, will display and demonstrate three direct-drive DSF Series servo presses. One of the demonstrations will feature an Aida DSF-N2-3000, a 300-ton straightside servo press recently purchased by Jagemann Stamping, Manitowoc, WI. In cooperation with Formtek/CWP and Pax Products, with material provided by Heidtman Steel Products, the press will be producing a pipe flange from 4.5 mm thick, 120 mm wide material via a progressive die operation. To demonstrate deep drawing in a servo press, Aida will showcase the benefits of using a servo die cushion (from Hyson products) in a servo press. 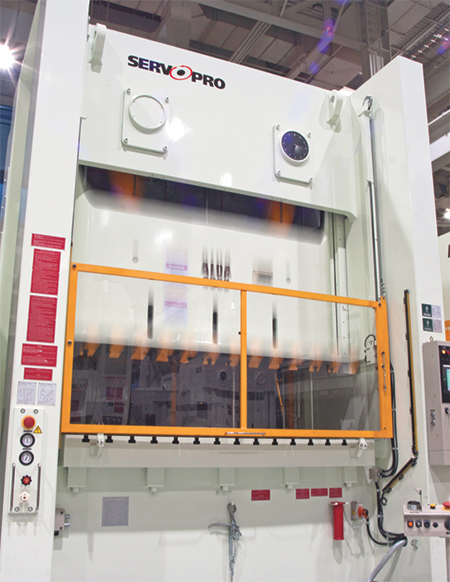 And, at its third demonstration area, booth visitors will spy an HSLA blanking operation, highlighting the ability of a DSF Series servo press to dramatically reduce reverse tonnage.